A Korean skincare routine can include 5 steps, or 12, or 15. All depends on your skin’s needs and what you want to achieve with your skin care. If you are interested in Korean skin care and the 10-step skin care routine, then try some of the following steps with your current skin care products as a start. You don’t need to buy products from Korea to try the 10-step skin care routine. 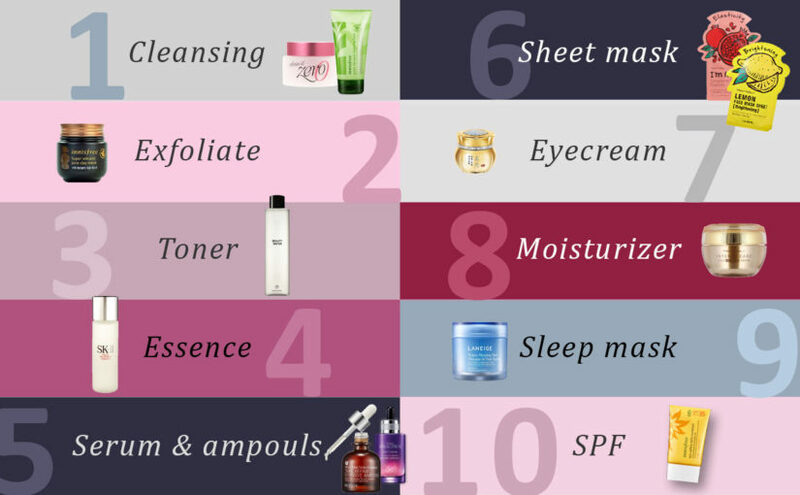 Below, information about all the steps in a Korean skin care routine and in which order to apply products. You don’t need ALL the steps to create a good skin care routine, but use this list as a guideline. Also read this article on Korean bestsellers and award winning products. The double cleansing is essential in Korean skin care. Start with an oil-based facial cleanser that melts and removes most of the dirt and makeup off your skin. Follow with a water-based facial cleanser that removes the last residues of dirt and oil. In this step you can also use a cleansing device such as Clarisonic or Foreo Luna. Exfoliate about 1-3 times a week using a classic face scrub, facial peeling or a chemical peeling that cleans the skin deeply and removes dead skin cells. A Korean toner is not quite the same as your regular toner in Europe. A Korean toner is used to restore the PH balance of the skin after cleansing and preparing the skin for skincare products followed. A korean toner rarely contains alcohol and is often patted into the skin using your hands. An essence looks like toner but is far more nourishing than a toner. Essence is patted in to the skin using your hands. Some essences are called first treatment essence and can be used instead of the toner, i.e. as the first step directly after cleansing. Korea is known for their sheet masks available in lots of different variations, scents and skin needs. Sheet masks are used about 1-3 times / week for 10-20 minutes. This step also include facial oils like argan or jojoba oil. Step 6 also includes the emulsion, a lighter type of moisturizer used in the night routine. Eye Creams in Korea works just the same as in Europe. Eye creams are formulated to suite the delicate skin around the eyes and used daily. Continue with a moisturizing face cream day or night. This step also includes lotion which is a lighter type of moisturizer and can be used during the day. A sleep mask, or sleep pack is typical in Korea, and used ones or more every week to “lock in” all creams and serums during the night. A sleep mask absorbs in to the skin as a protective layer. Wash off in the morning during the morning routine. In Korea, sunscreen or SPF is a must during daytime. SPF is therefore always included in a Korean skin care routine, apply in the morning. If you are unsure of the order in which to apply skin care products, a good rule is to always apply thinnest to thickest. Find out more about the best korean products in this article: award winners and bestellers.